Summer is the best time of the year, and we’re here to make sure that you’re ready to make this your ultimate raw vegan summer. Choosing foods each day that are rich in vitamins and minerals is the best way your body is getting what it needs to be healthy so in this issue, we’ve included the BEST foods for every vitamins and minerals. Making sure you’re summer-ready with these 8 Vegan Summer Beauty Essentials, and not to mention beach body perfect with these 8 Superfoods to help you lose weight this summer. Still having difficulties in losing weight? Why not try ACUPUNCTURE? Here are reasons why you should. Have you booked a place for your summer trip yet? Let’s help you decide with this list of 5 vegan-friendly beach towns, perfect for this summer! An interview with another awesome chef, Aarika Chilson of JustBeetIt, will inspire you on her BEETastic journey to help you in yours to introducing more healthy, vegan and raw foods in your diet. Continue on what you’ve started and make this year the best year ever! Start your Free Trial now because we’ve got more gifts inside waiting for you to unwrap. 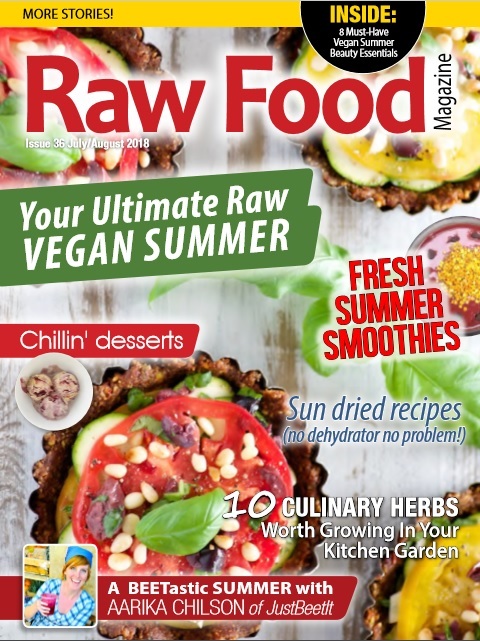 Click the Green Button to subscribe to Raw Food Magazine.